1910 Mussolini joins the Socialist Party. August 1914 World War 1 begins. Italy remains neutral. November 1914 Mussolini is expelled from the Socialist Party for his position on Italy joining WW1. April 1915 Italy is promised territoty by the Allies if they join against the Central Powers. May 1915 Italy declares war on Austria and Hungary. October 1917 Italy loses the battle of Caporetto. October 1918 Italy wins the Battle of Vittorio Veneto. March 1919 Mussolini founds a Fascist Party. 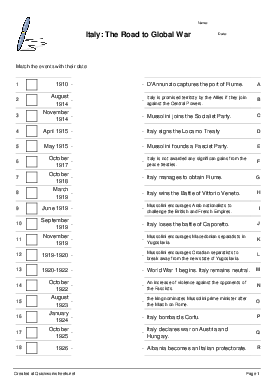 June 1919 Italy is not awarded any significan gains from the peace treaties. September 1919 D'Annunzio captures the port of Fiume. November 1919 Despite winning a majority of votes, the Catholic and Socialist parties are unable to form a government. 1919-1920 widespread social unrest 1920-1922 An increase of violence against the opponents of the Fascists. October 1922 the king nominates Mussolini prime minister after the March on Rome. August 1923 Italy bombards Corfu. January 1924 Italy manages to obtain Fiume. October 1925 Italy signs the Locarno Treaty 1926 Albania becomes an Italian protectorate. 1927 Mussolini encourages Croatian separatists to break away from the new state of Yugoslavia. 1928 Mussolini encourages Arab nationalists to challenge the British and French Empires. 1929 Mussolini encourages Macedonian separatists in Yugoslavia.